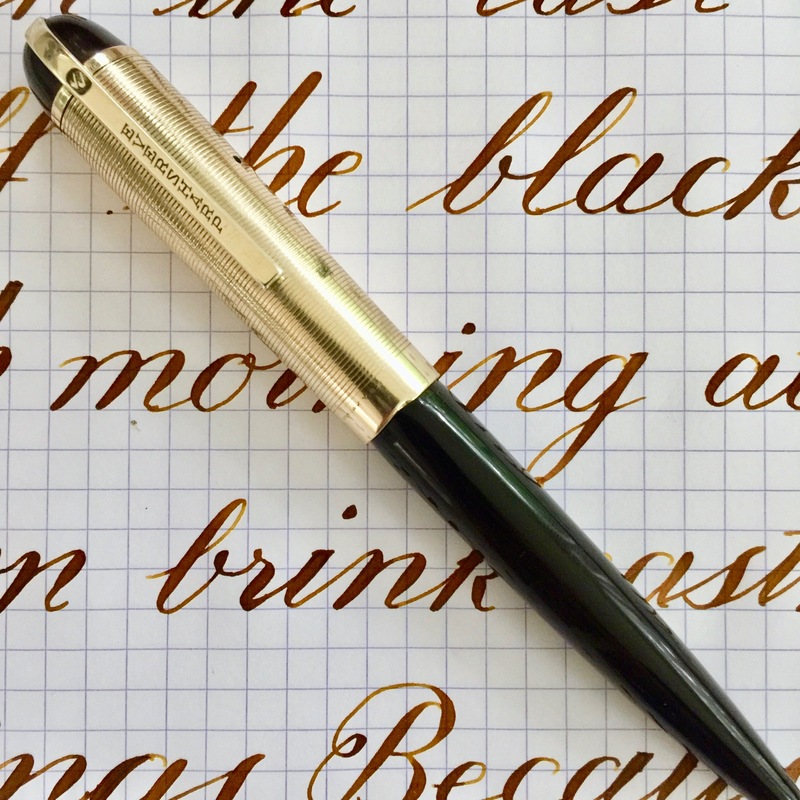 This Parker Lucky Curve vest size, ring top pen is made of black hard rubber with a gold-filled top. The body is nothing to write home about. The hard rubber has not faded a lot and is still very black. 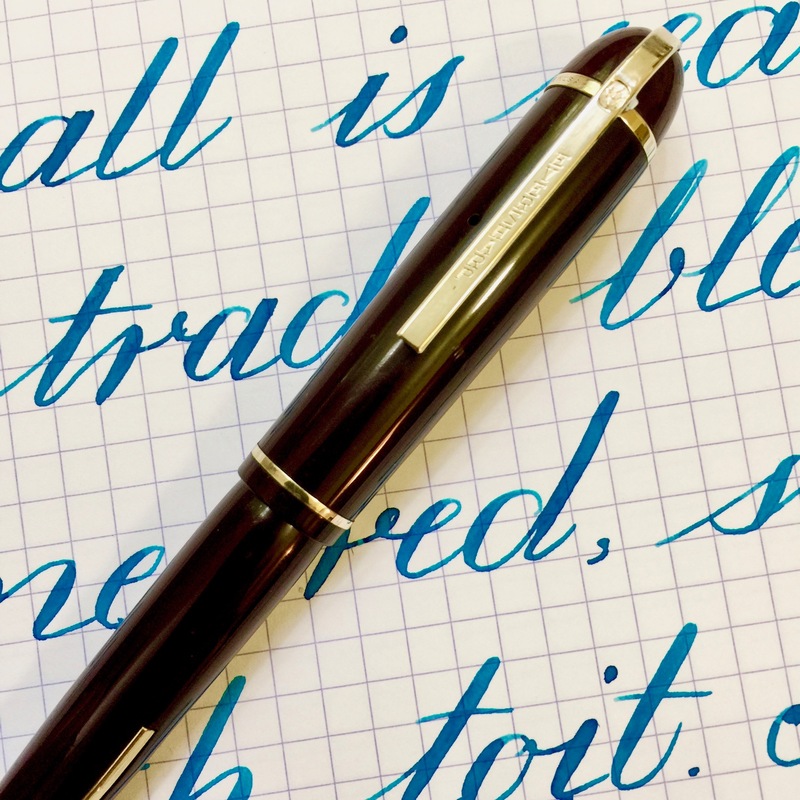 The body is smooth (no original chasing, I believe), but there is some light scratching throughout the pen. The imprints are faded some. Mostly they are readable, but there are a few parts you cannot read. The gold-filled crown and ring top have no brassing, but there are some light dings. 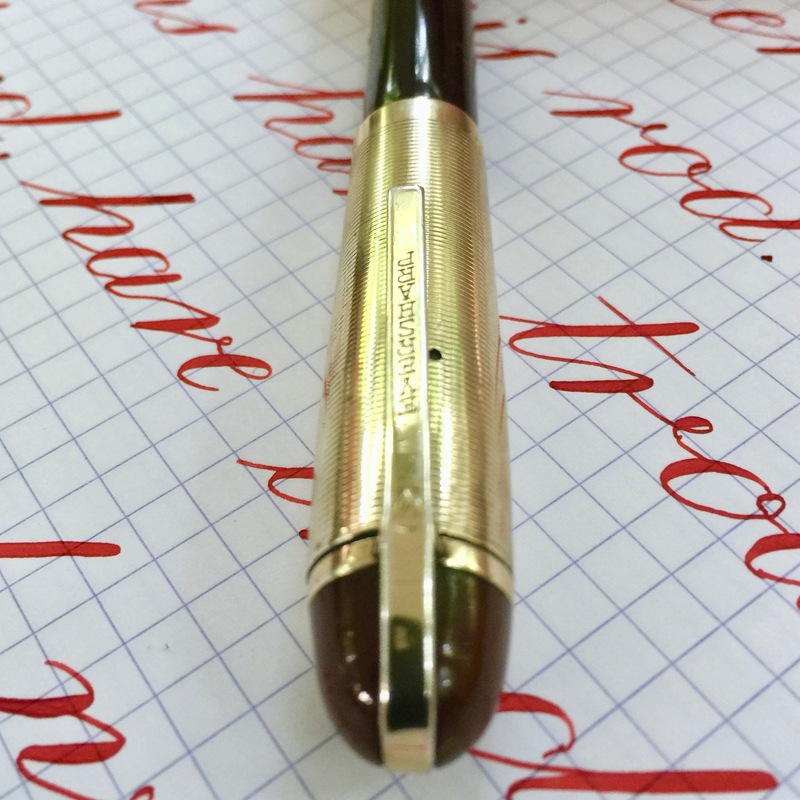 What is special about the pen is the 14kt. 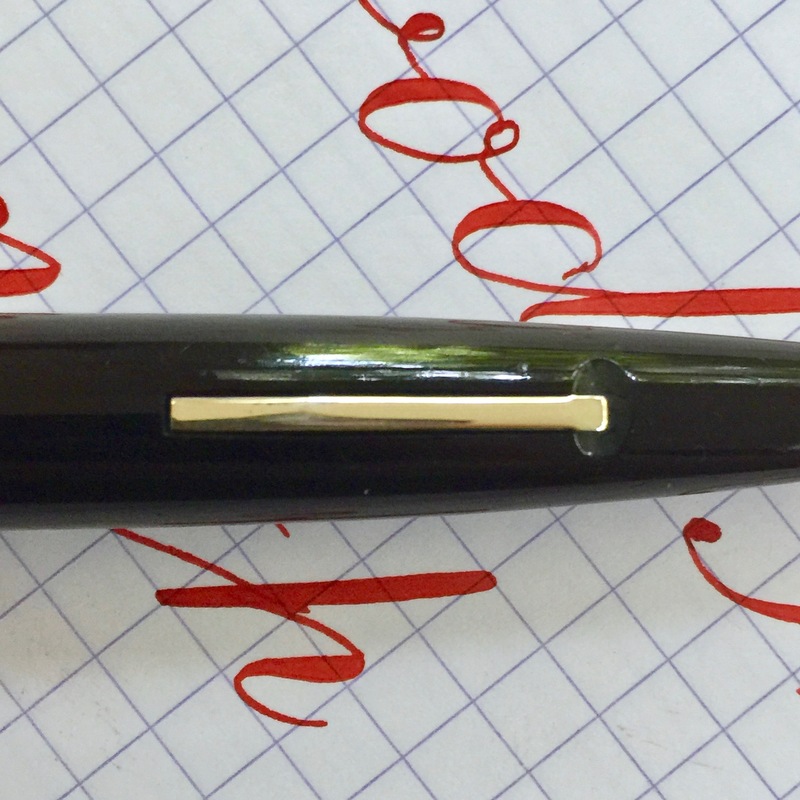 Parker Lucky Curve #2 nib. 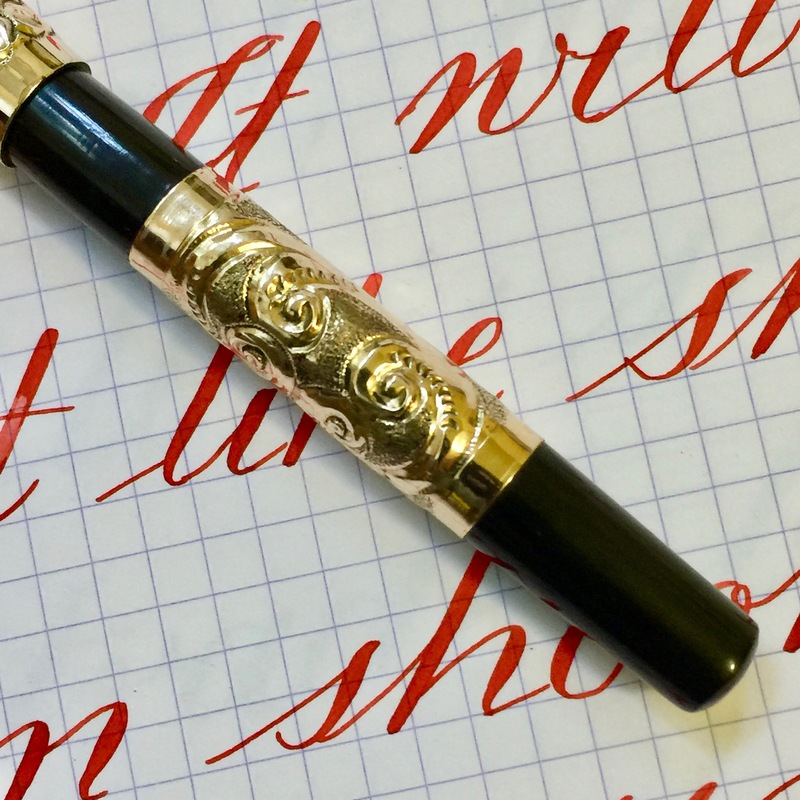 It writes normally as a smooth and wet writing F. It’s a really lovely, soft, elegant writer. 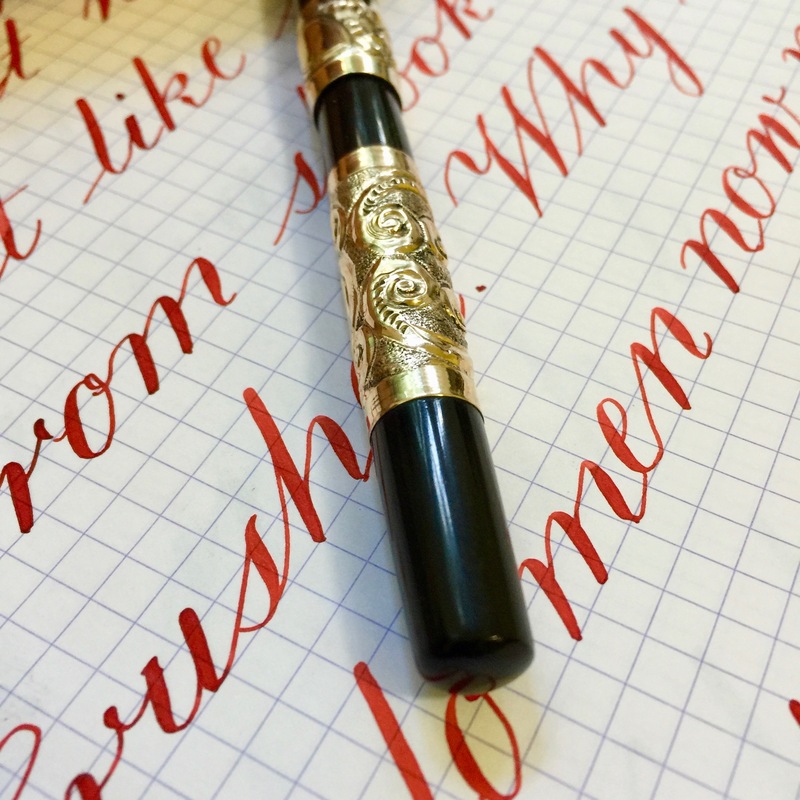 But the flex on this pen is sheer pleasure. 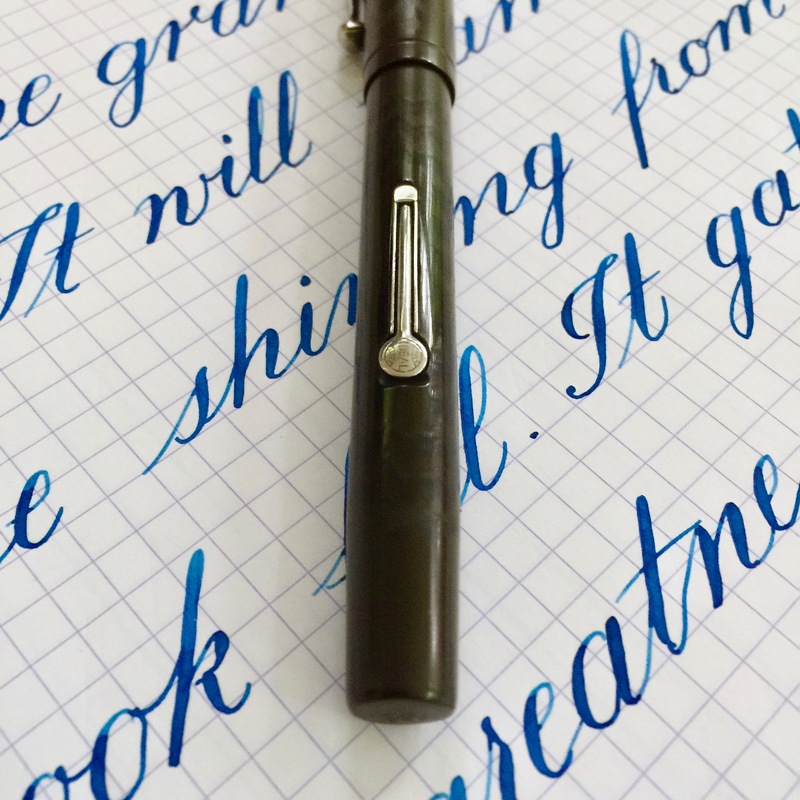 This nib isn’t paintbrush soft. 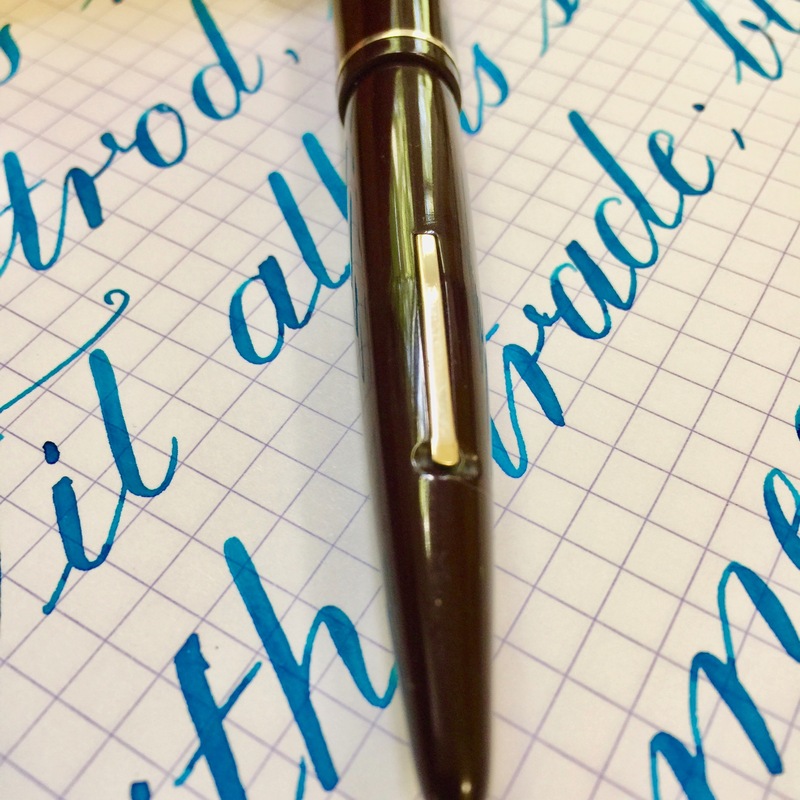 I would even say it’s borderline between “super flex” and “wet noodle.” But the responsiveness of this nib is rare. 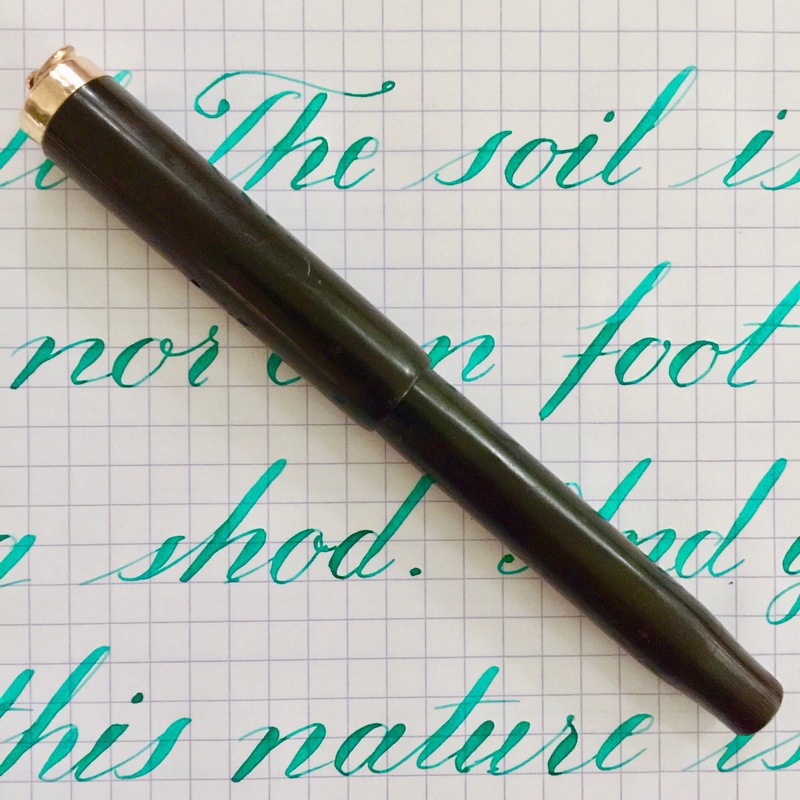 This is a nib for artists and calligraphers. 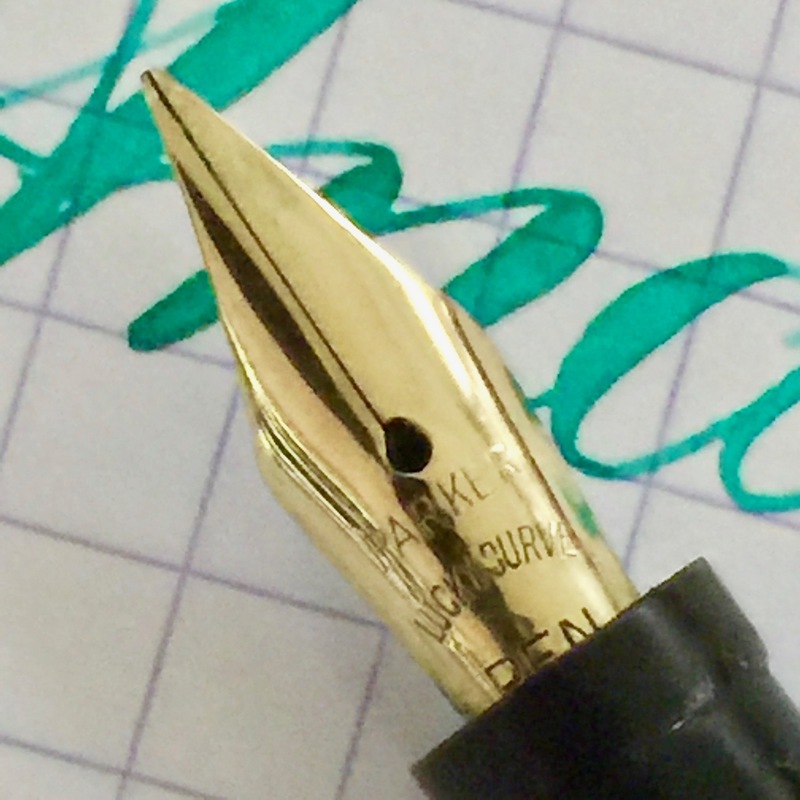 This is a wet pen, and it’s not a needle point, and that just makes the responsiveness of this nib that much more impressive. 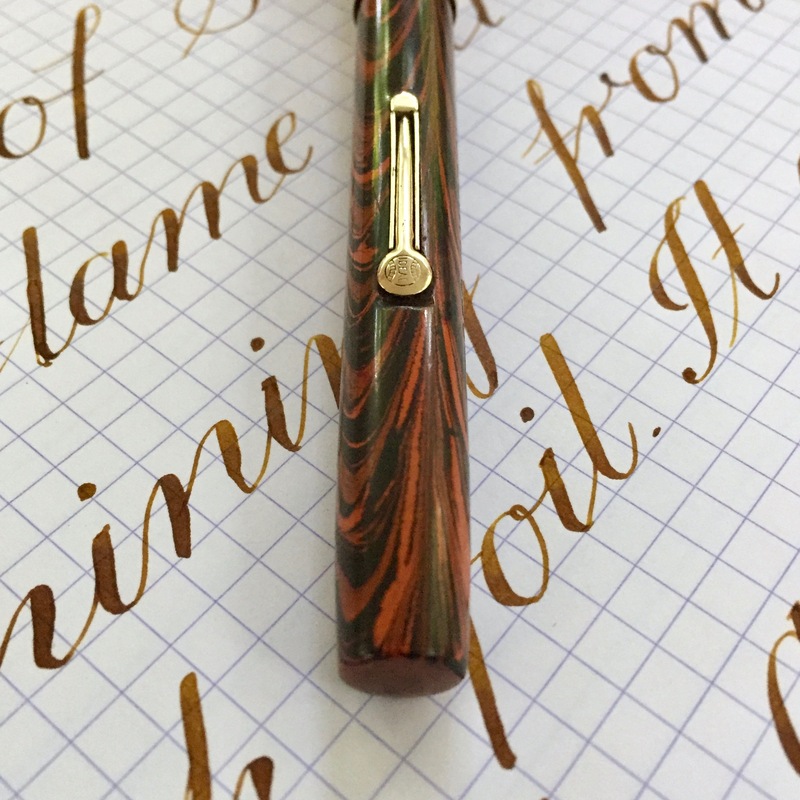 Here is a nib that will not disappoint. This is a beautiful standard size Skyline in black with the gold-filled cap and trim. 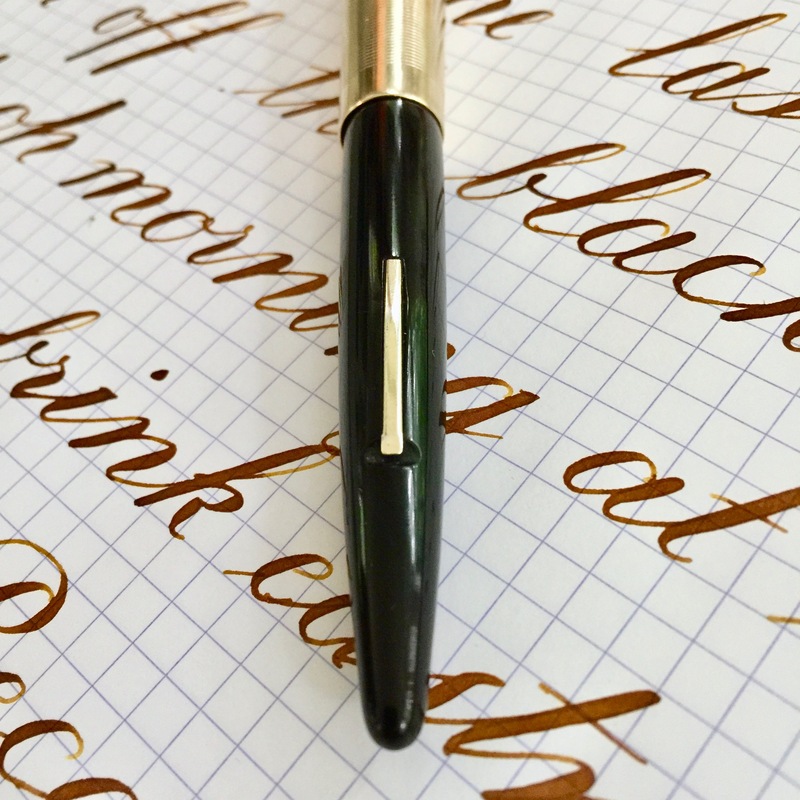 There is some light scratching throughout the body of the pen, but most of it I have buffed and polished out. The gold-filled trim is in excellent condition. There is a bit of plate loss on the crown of the lever, but it isn’t very noticeable. The cap is in good condition as well. There is a small ding in the lip of the cap but otherwise it is pretty clean. The 14kt. 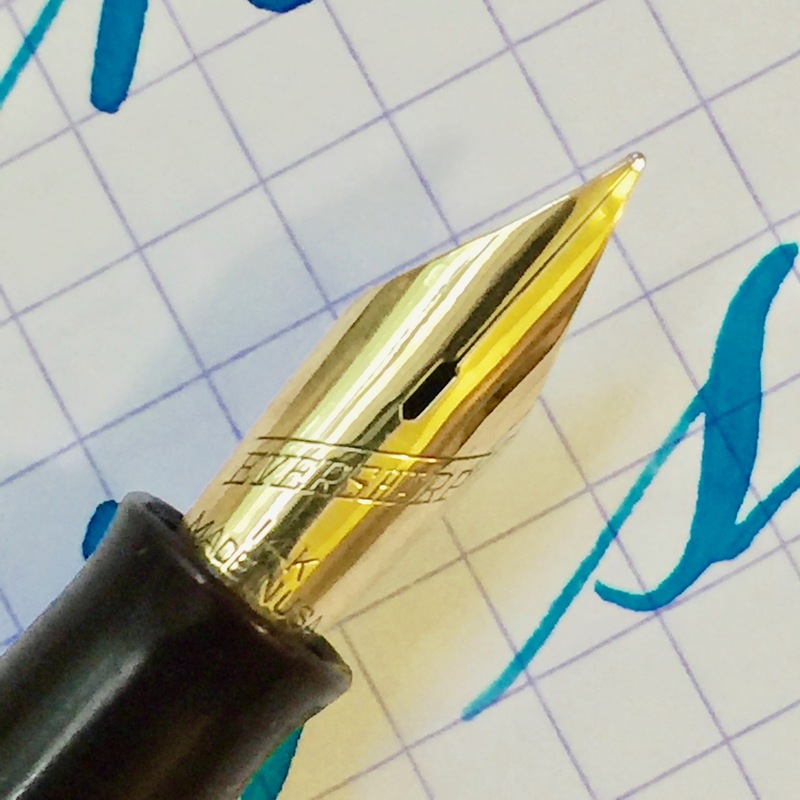 Eversharp nib is a very wet writing M nib that is buttery smooth. 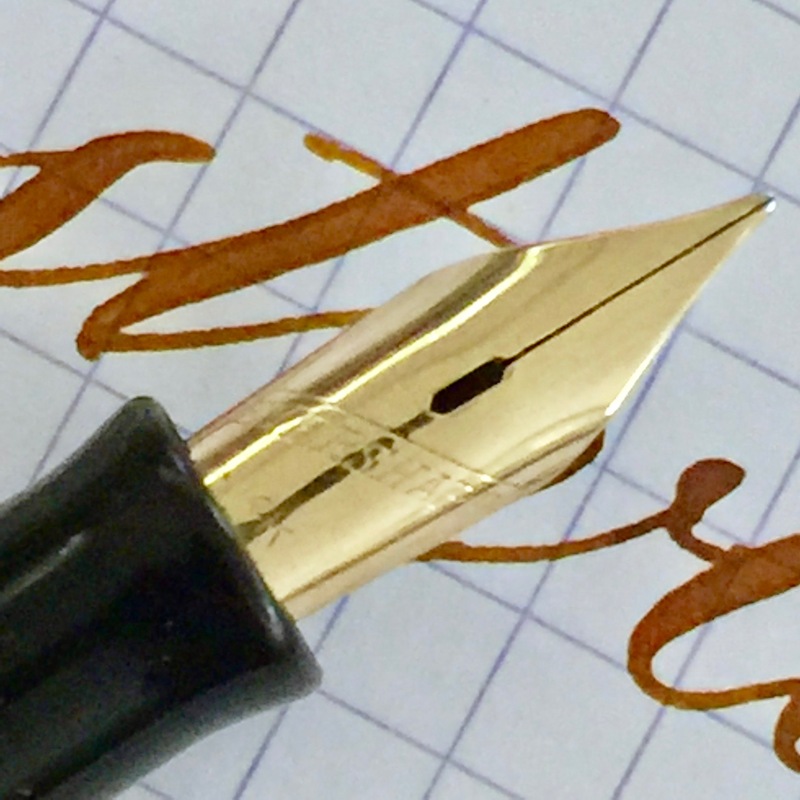 The flex on this nib is superb. The flex comes with ease, and it is smooth and very wet. No railroading here. 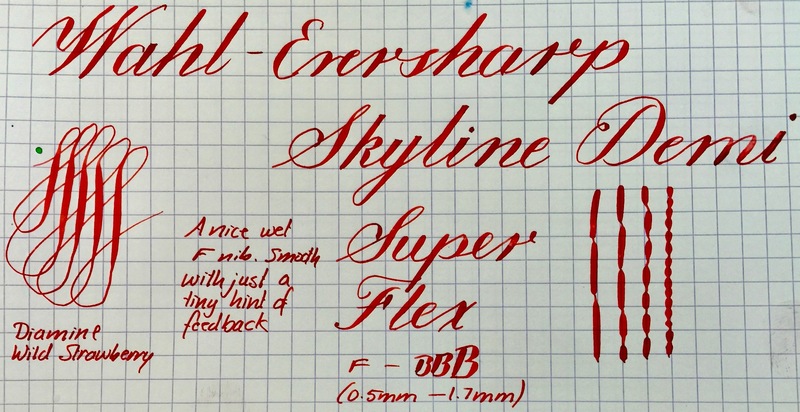 It’s one of the better Skyline flex nibs that I have come across recently. This is a top notch Skyline. 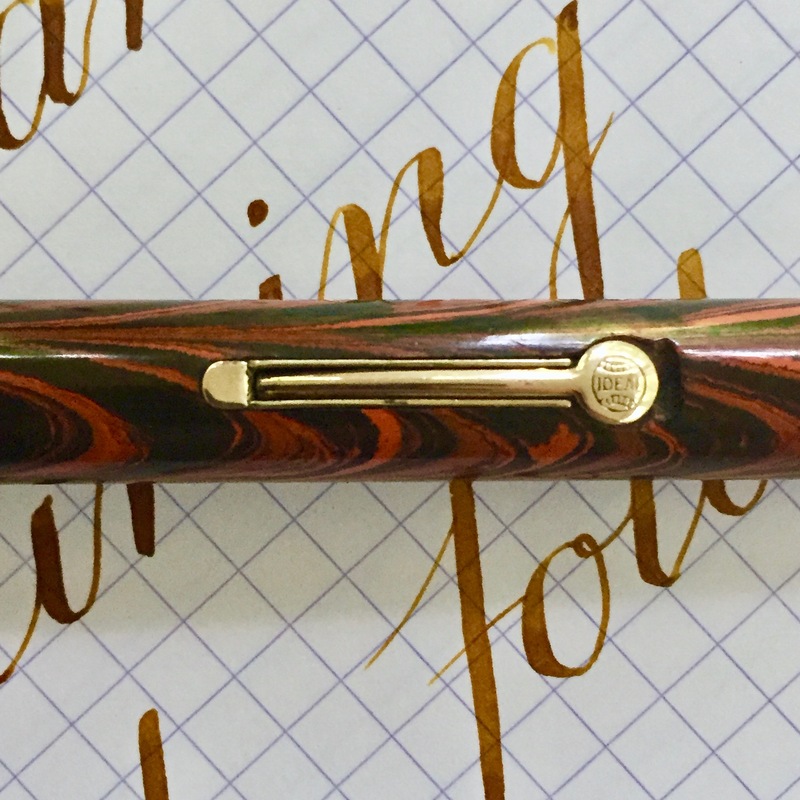 The Waterman 14 P.S.F. (Pocket Self Filler) is the early version of a “54.” This is made of BCHR. The color has faded some to a dark brown. The chasing is worn but still visible. Imprints are a bit worn also, but still easily readable. The original clip is no longer present, but it does have a nice, clean accommodation clip. The nickel lever is in good shape with no brassing. 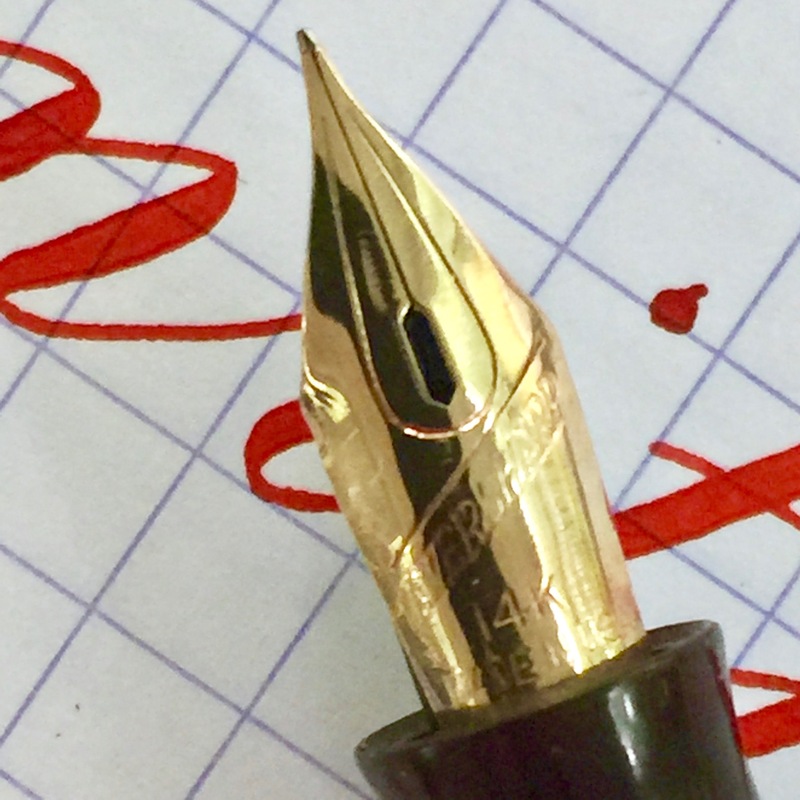 The biggest flaw in the pen is that the 14kt. Waterman #4 has a crack at the base. 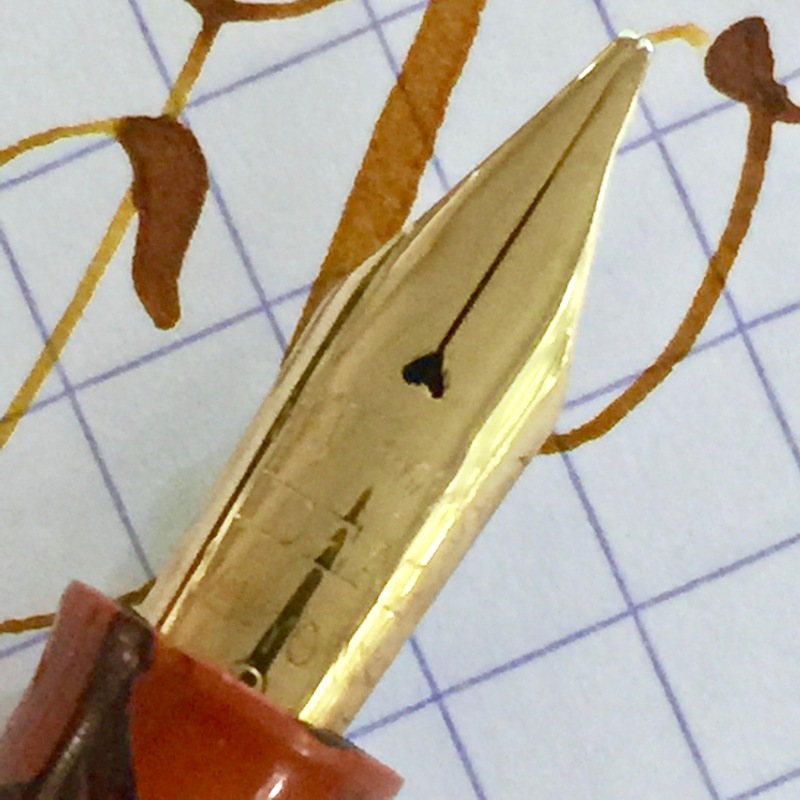 It runs from the back of the nib up to the “IDEAL” imprint. The crack is not nearly as problematic as it would be if it were on the tines. 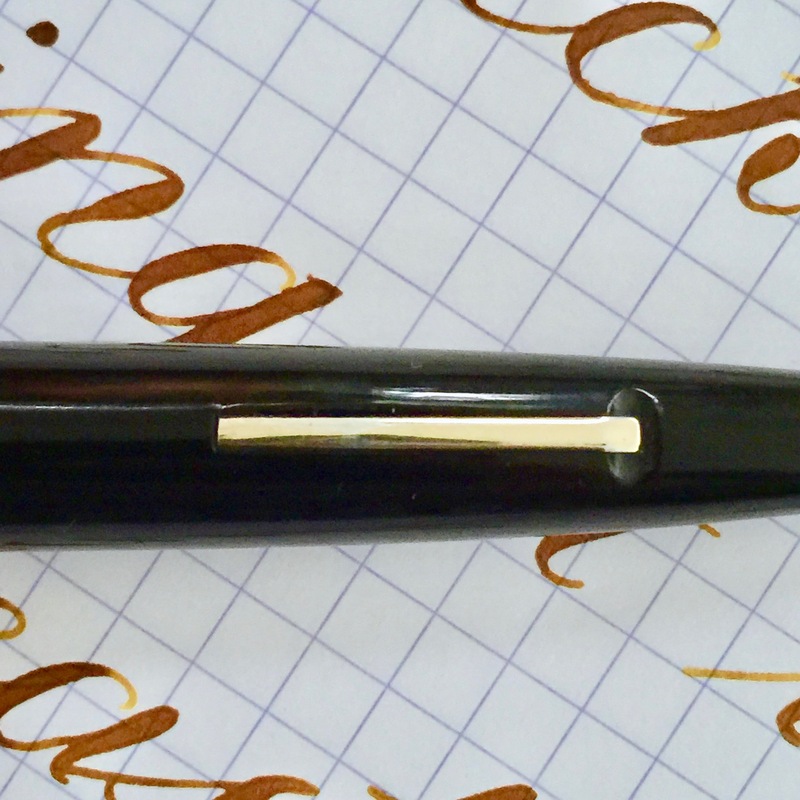 The section holds the nib (and crack) tight and stable. The nib is a gorgeous writer. It is a soft and ultra smooth F (0.4mm). It also has some flex. This feed isn’t going to ever railroad and that also makes the range of flex higher going up to BB+ (1.6mm). Ease of flex is a bit on the stiff side, and so the “Medium/ Good Flex” grade. Here is a beautiful vintage, unbranded eyedropper fountain with stunning gold-filled repousse bands. Being unbranded there is no sure way to tell exactly what the date of it’s production. But these types of pens, especially in this repousse style, were made primarily in the 1880s-1910s, so it is highly likely that it comes from that span. The smooth hard rubber (no original chasing) has faded a little bit. I would say it’s grayed a bit more than it has browned. It’s still pretty much black though. The gold-filled repousse bands are in great condition with no braising. 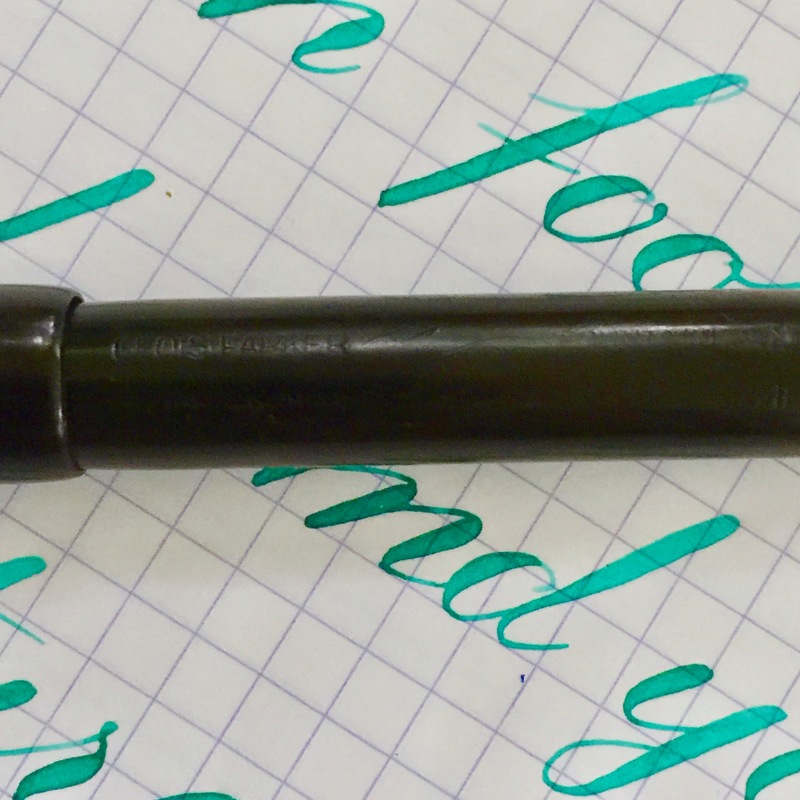 There are a few tiny dings in the blank area of the barrel meant for inscriptions (there are none on this pen). The 14kt. nib is also unbranded. 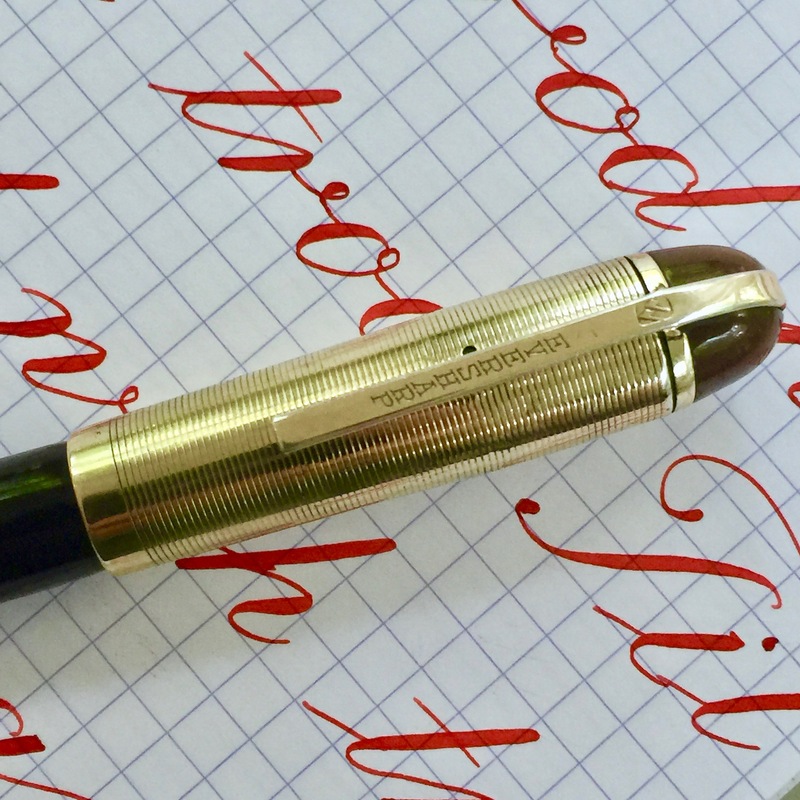 It is a long-tined and elegant nib. 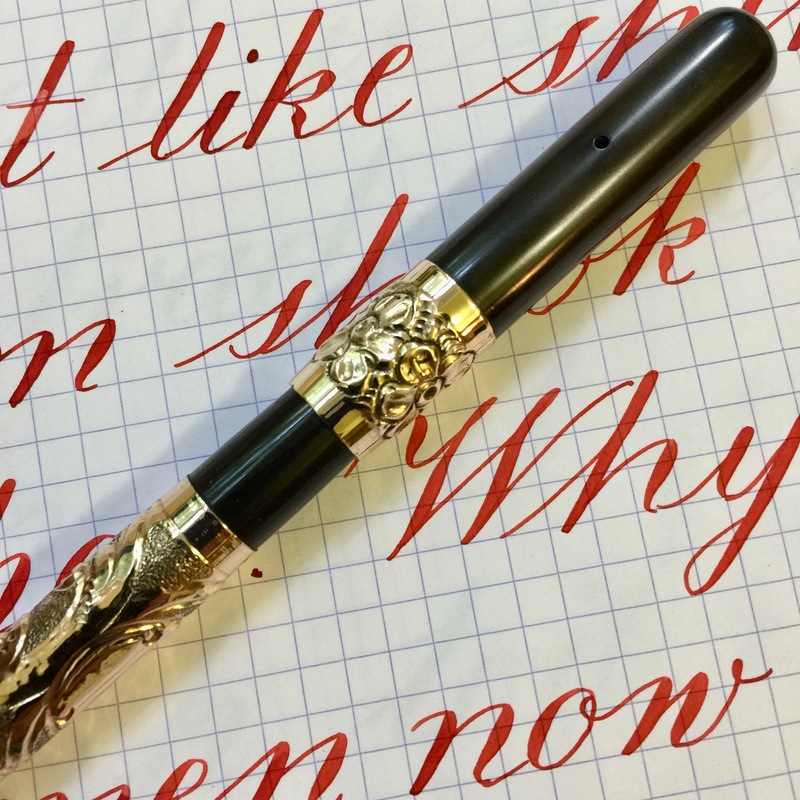 It writes very lovely, very soft. 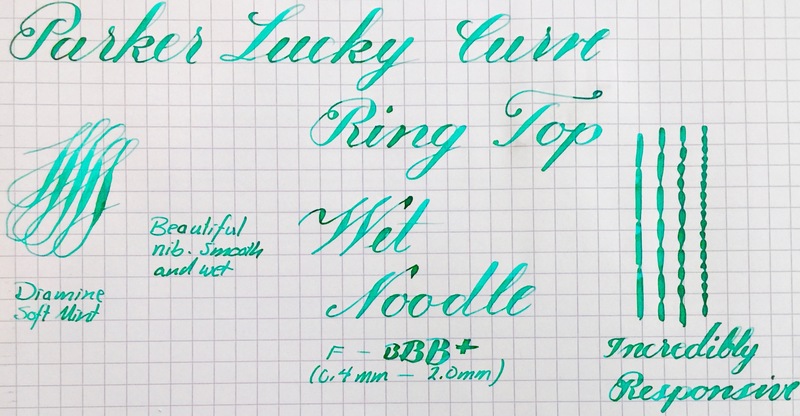 It is a wet writing F (0.4mm) that is smooth. 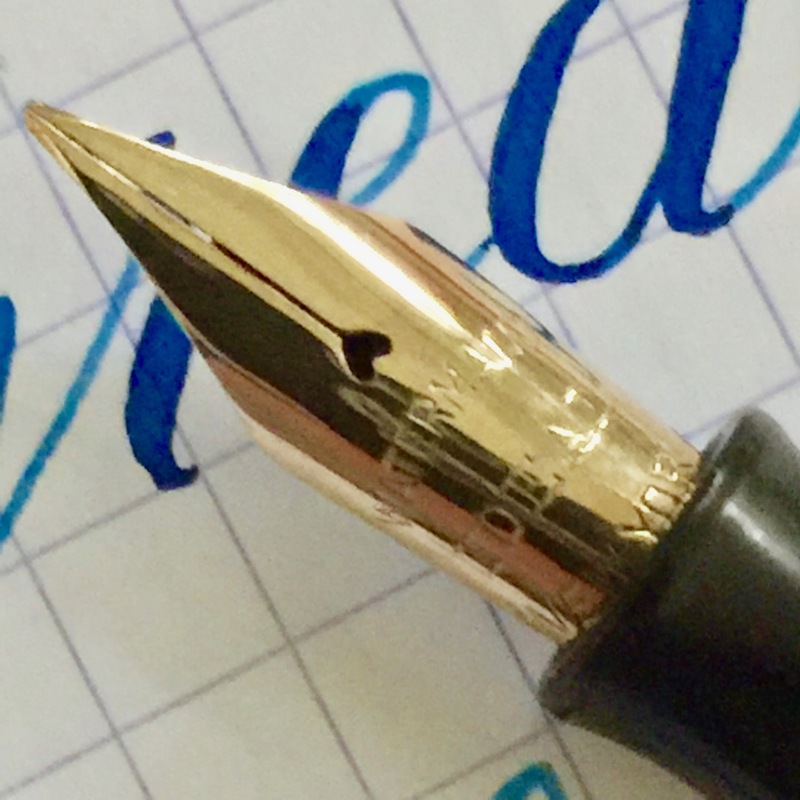 The flex on this nib is also very nice. 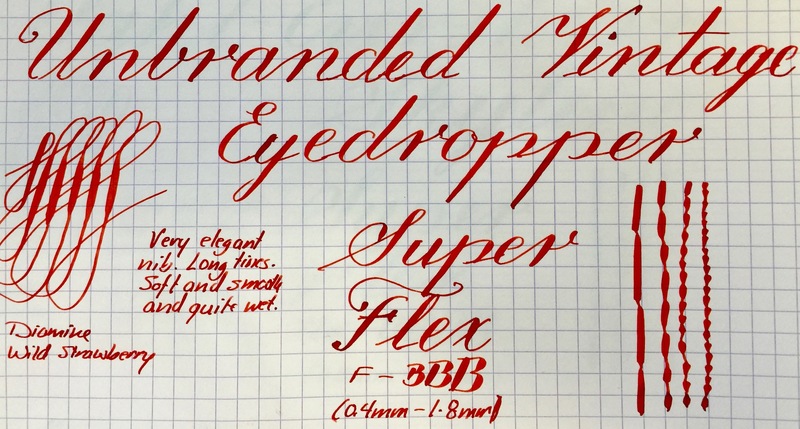 I would say it’s a pretty solid “super flex.” It’s ranges from 0.4mm (F) to a large 1.8mm (BBB). That’s 1.4mm of range, so pretty good. 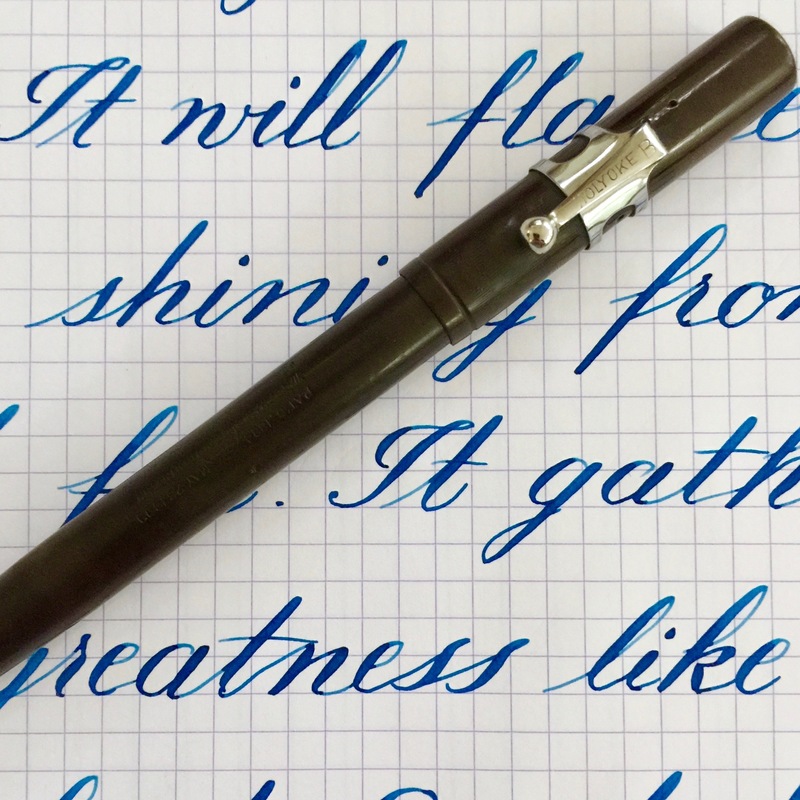 It has average responsiveness (many of these old eyedroppers do due to how wet they write). 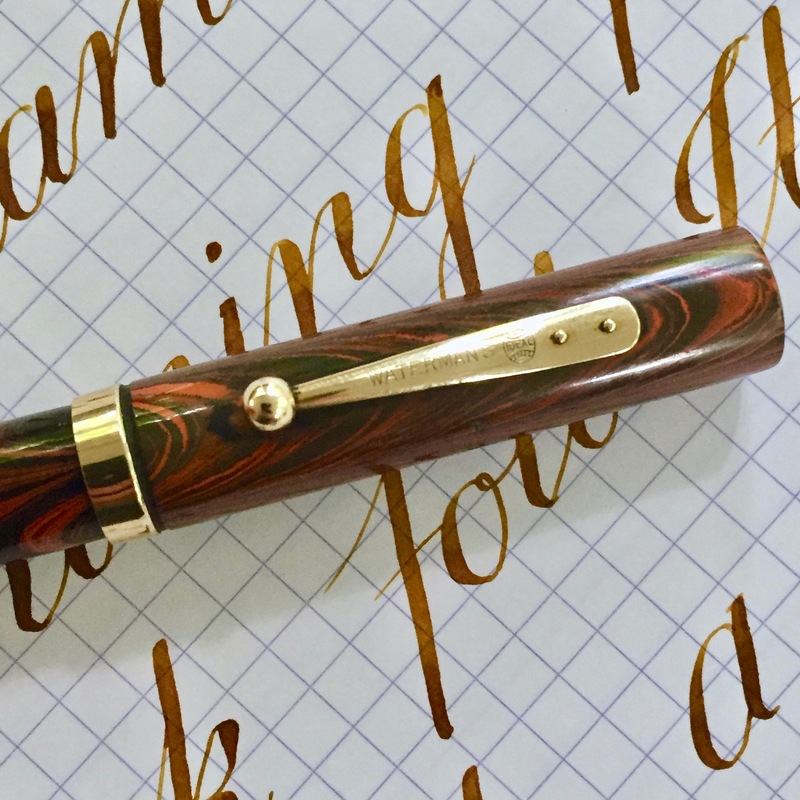 It’s a stunning vintage pen that will fit well into any vintage pen collection. 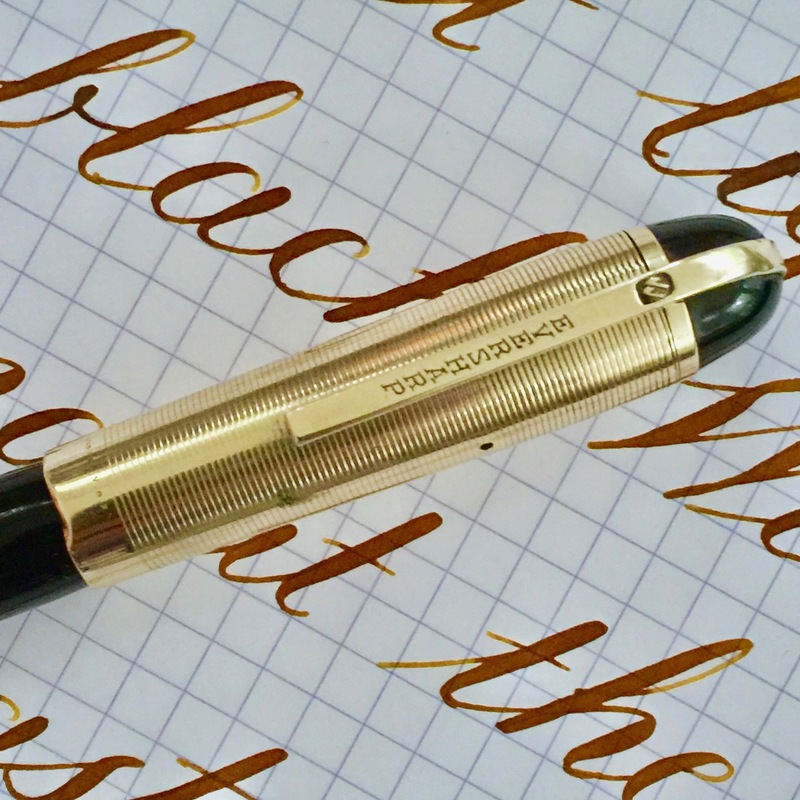 This standard size Wahl-Eversharp Skyline is in dark burgundy color with gold filled trim. 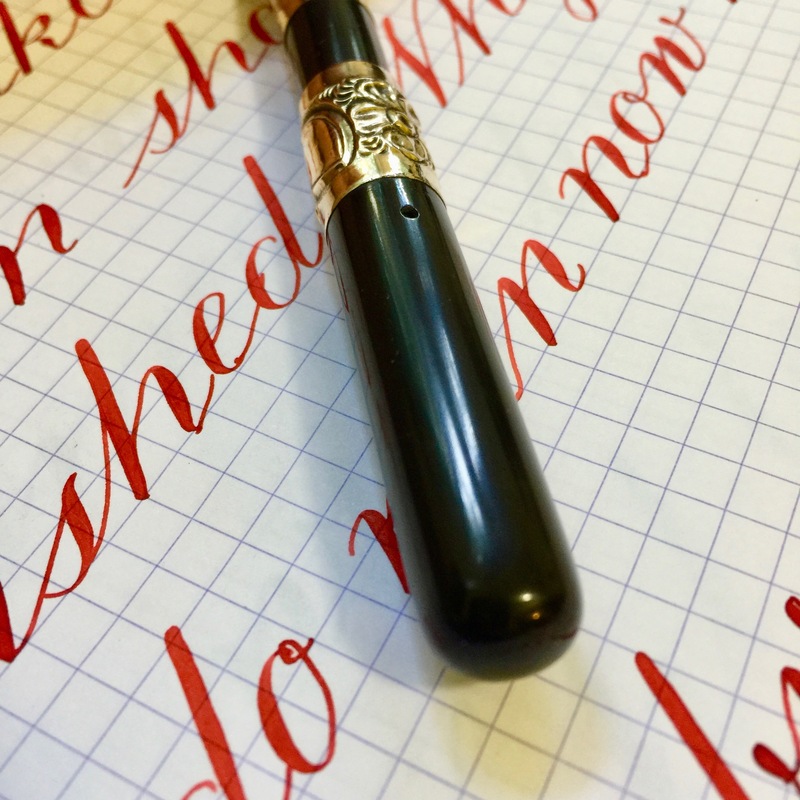 The pen is in very lovely shape. 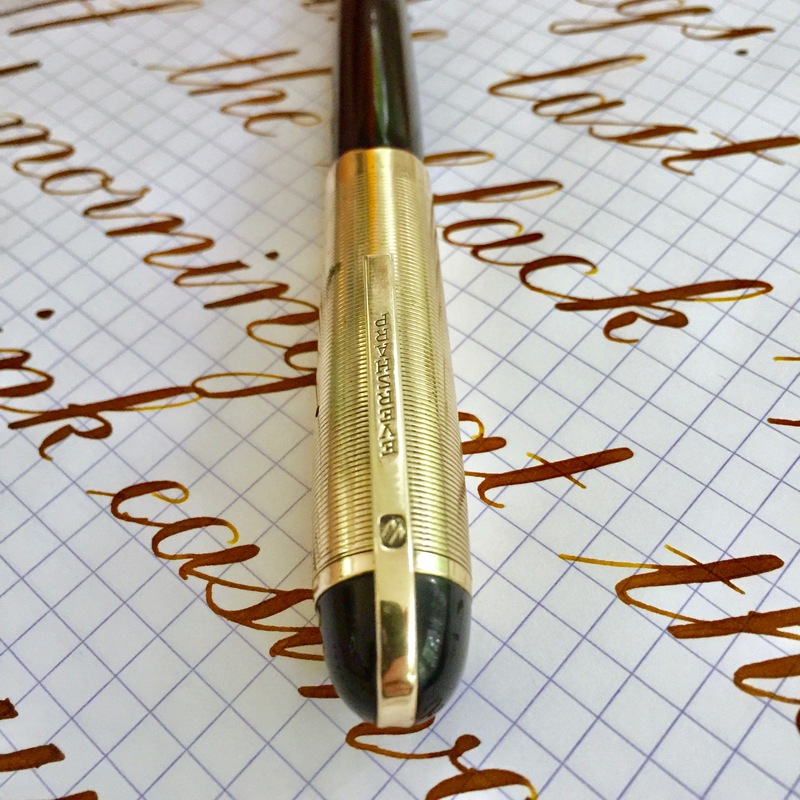 The body has some very light scratching as it typical for these pens. There is a small but deeper scratch next to the clip where the bottom the clip dug into the cap a bit. The gold-filled trim is in beautiful condition with no braising. 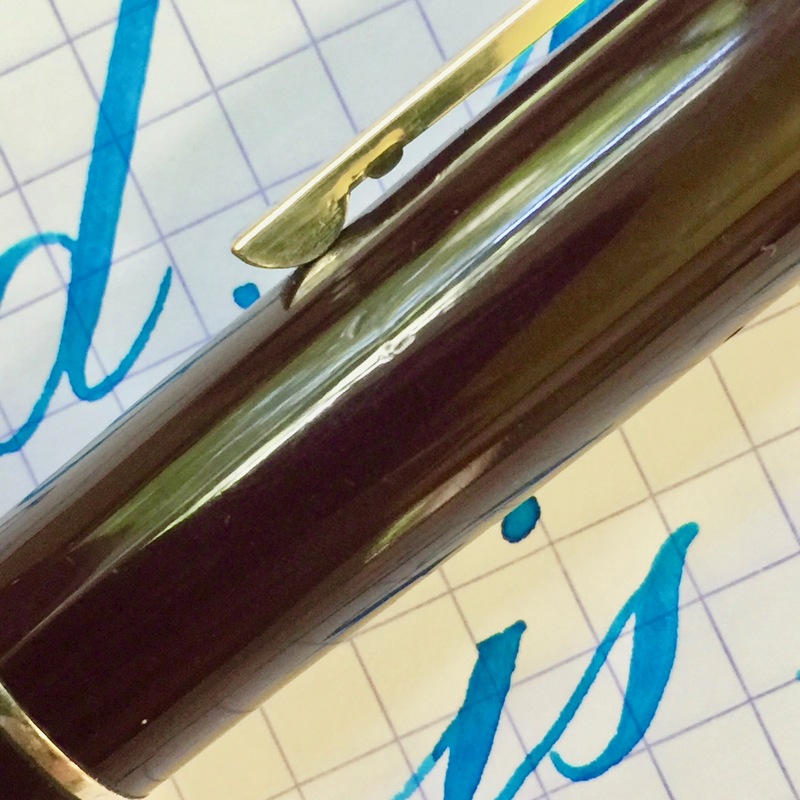 There are really no other blemishes on the pen. The 14kt. 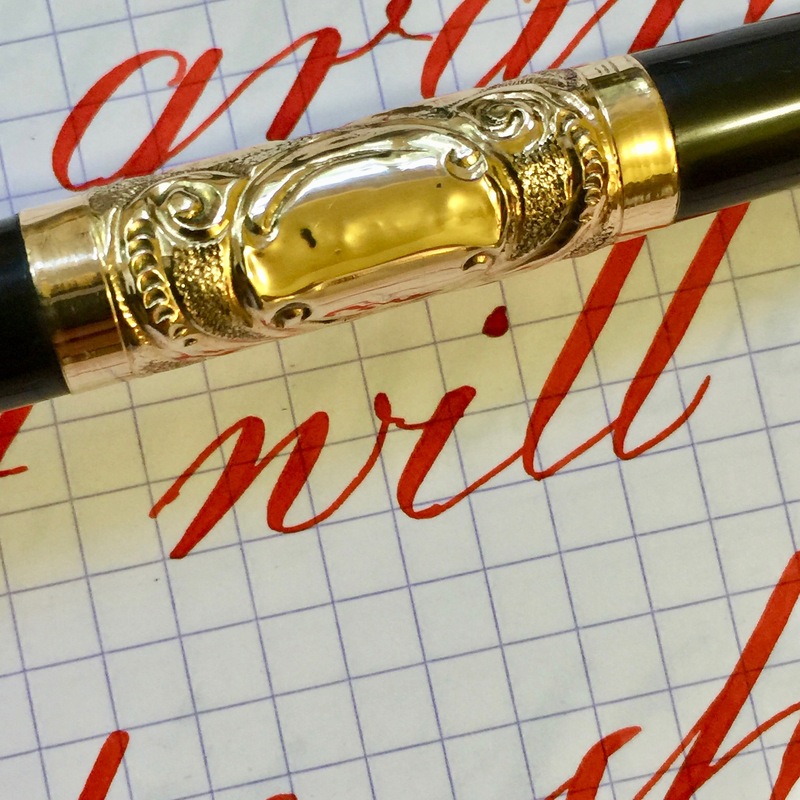 Eversharp nib is a gorgeous writing F/M. It’s smooth and very wet. 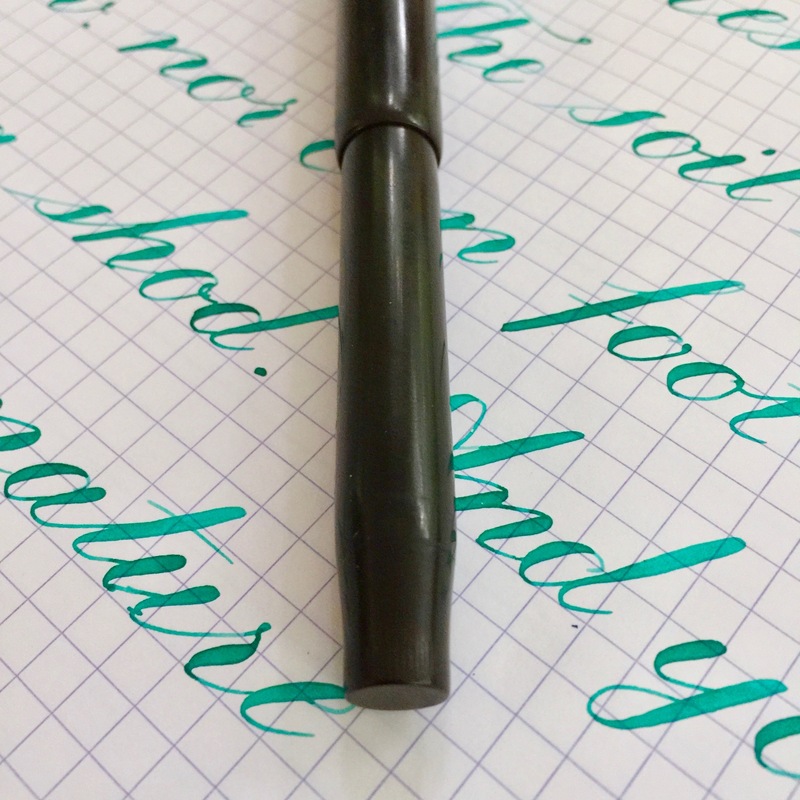 Technically, it’s a 0.5mm nib but it feels wider than that due to how wet it is. 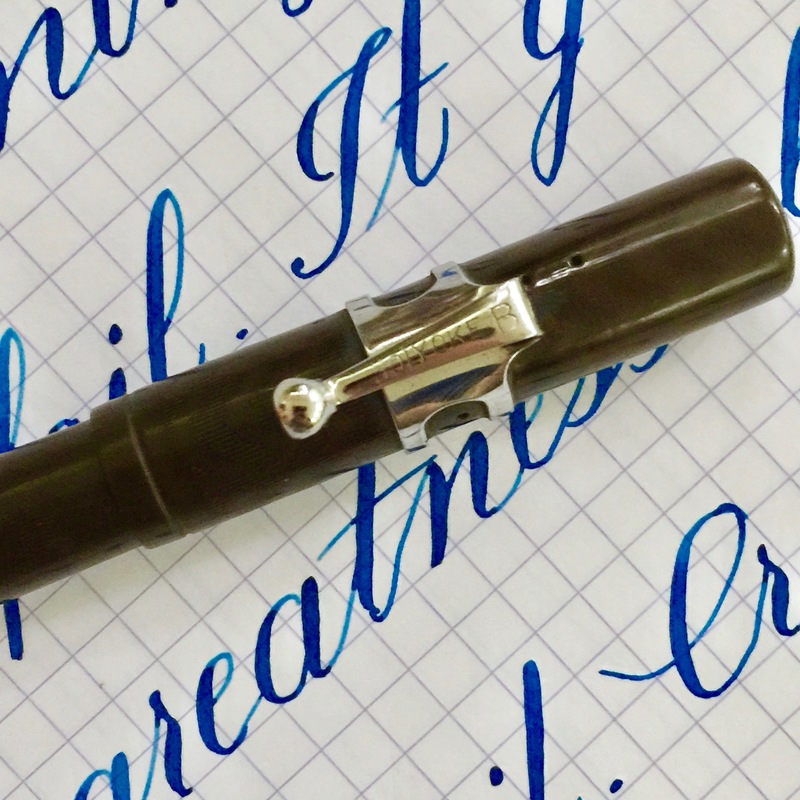 The flex on this nib is large going up to 2.2mm (BBBB). It’s not quite as responsive as I would like, but the range of flex is so large it isn’t hard to compensate. 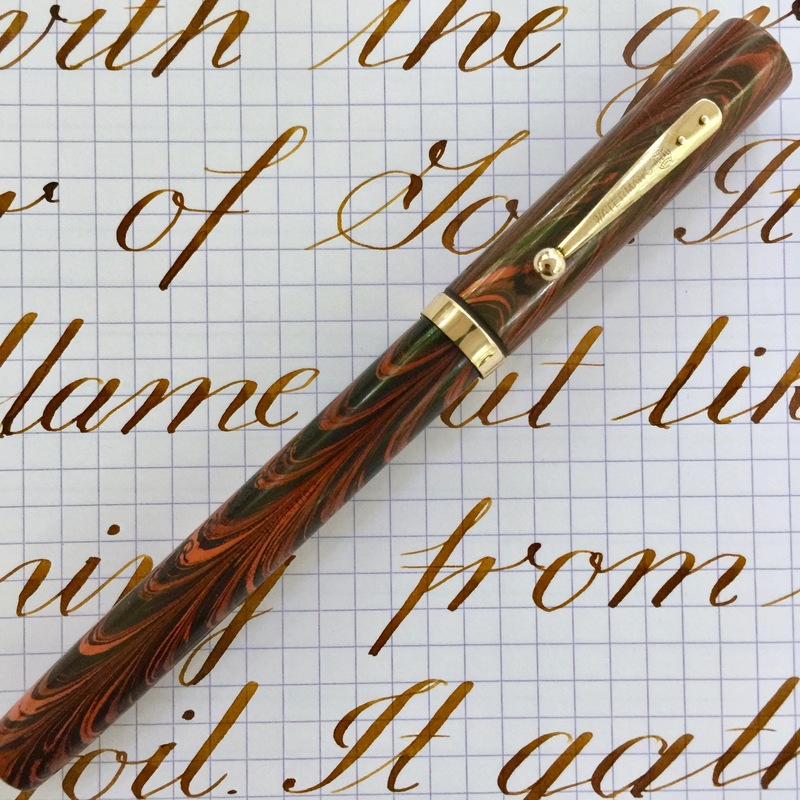 Here is a nice Waterman 52 in red ripple hard rubber. 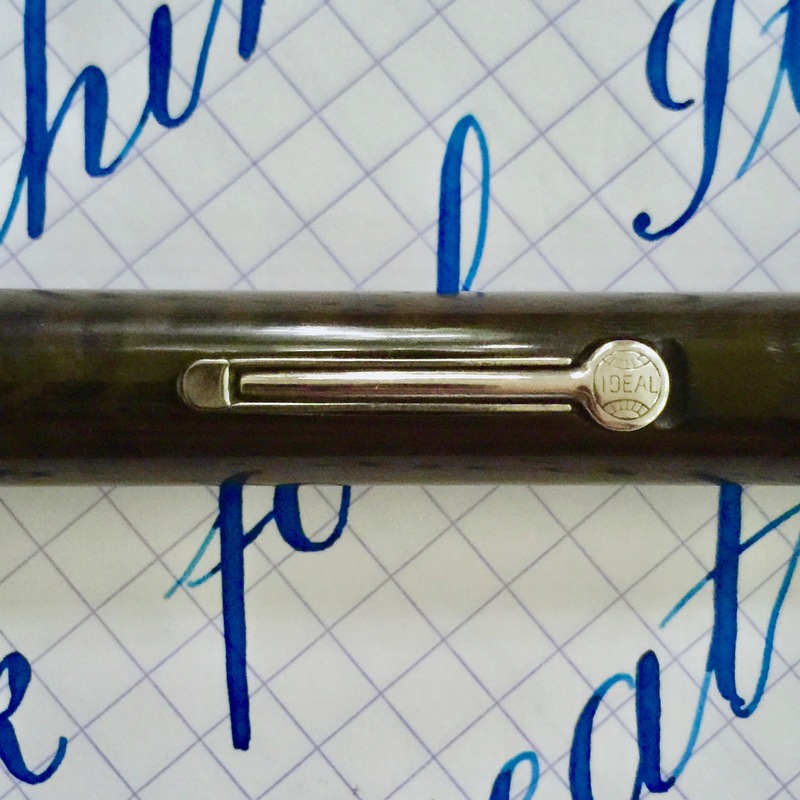 The pen is in pretty good shape. There is some fading to the ripple hard rubber, but it isn’t too significant. There is a lot of color left. The gold-filled trim is lovely as well. There is a little bit of brassing on the edges of the “globe” on the lever, but it isn’t terribly noticeable. The rest of the trim has no brassing. It has the name “Geo. W. Harrison” engraved in the side of the barrel. 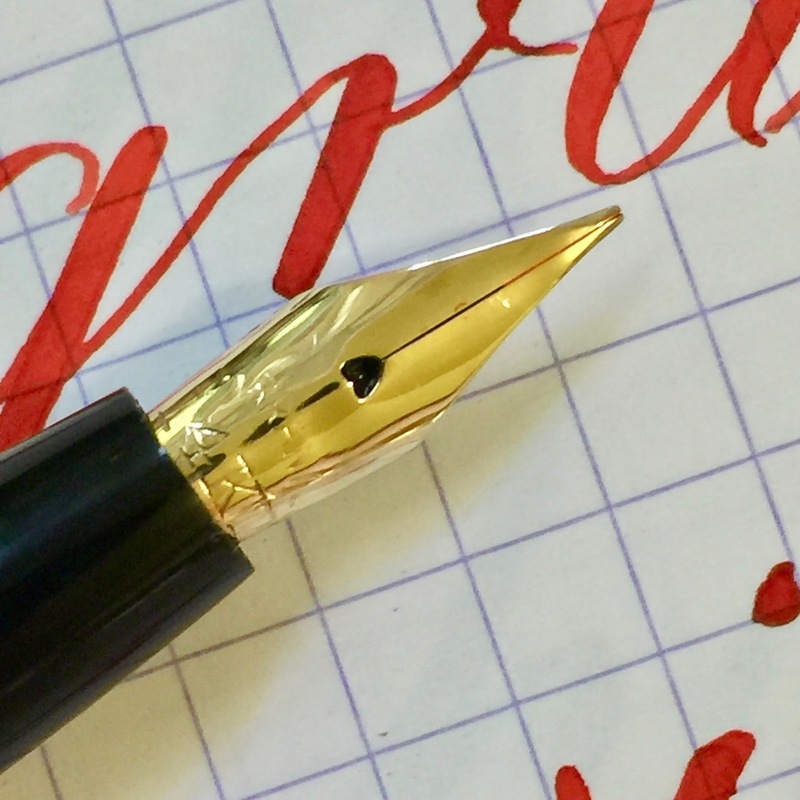 The star of the pen is the nib, and it is quite a star. It’s a Fine Stub (0.5mm) that’s between medium wet to wet. 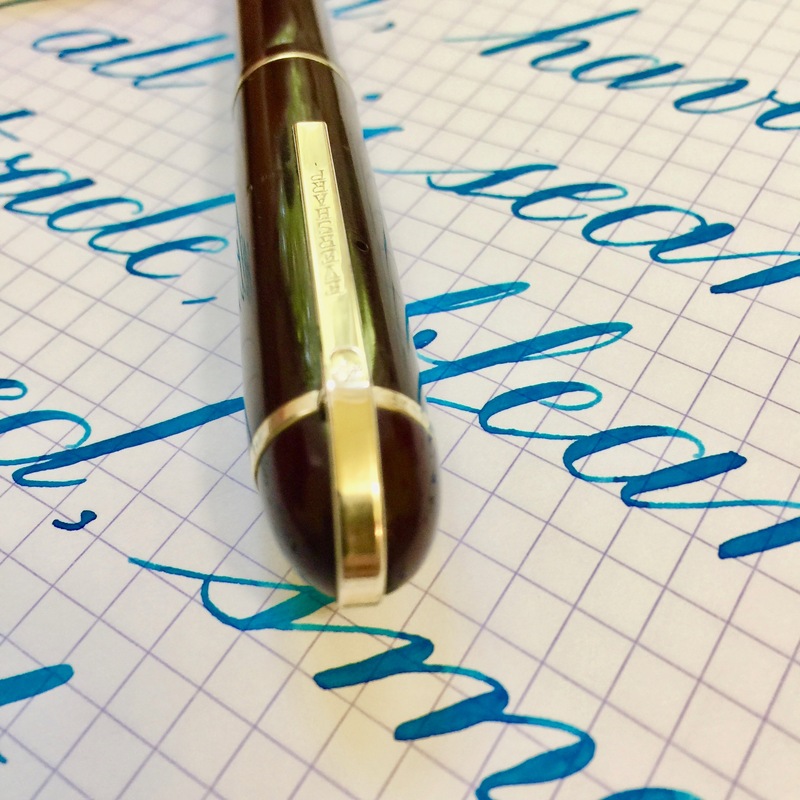 Some would call this a cursive italic. It’s sharp enough to get some nice line variation, but not so sharp that edges catch.It is also a superb Wet Noodle with paintbrush softness. 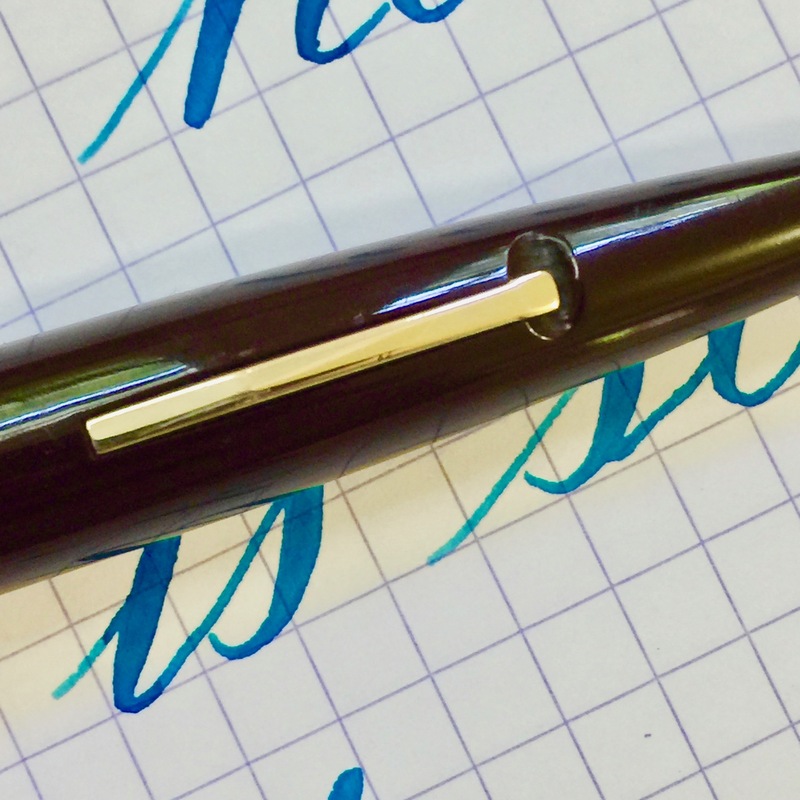 The flex on the pen goes from 0.5mm to 2.1mm (BBBB). 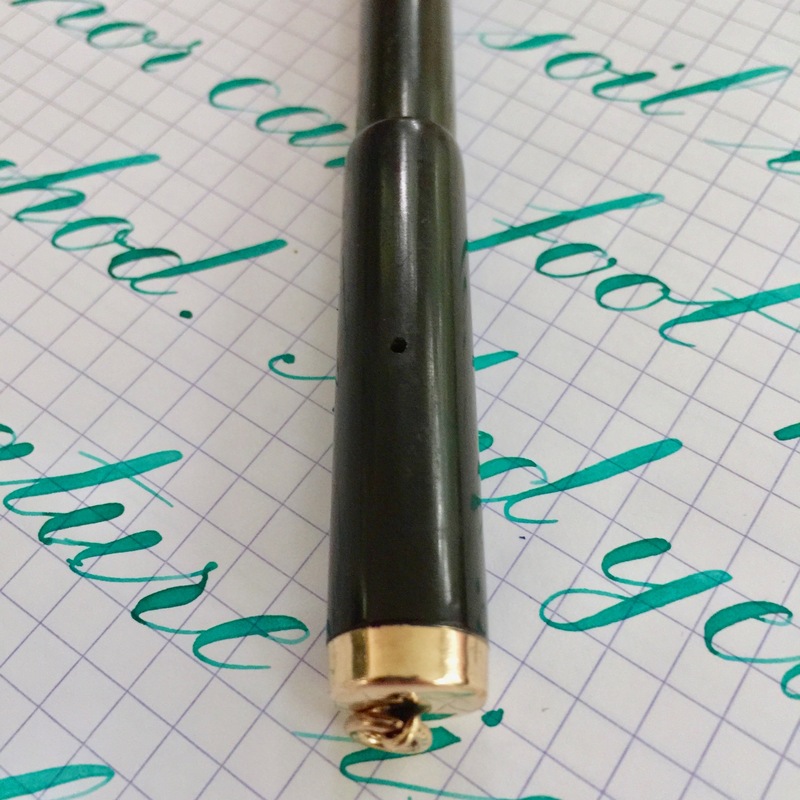 The nib had sustained a crack out of the right side of the breather hole, but Greg Minuskin has laser welded it. You can’t even see the crack anymore and it’s stronger than ever. 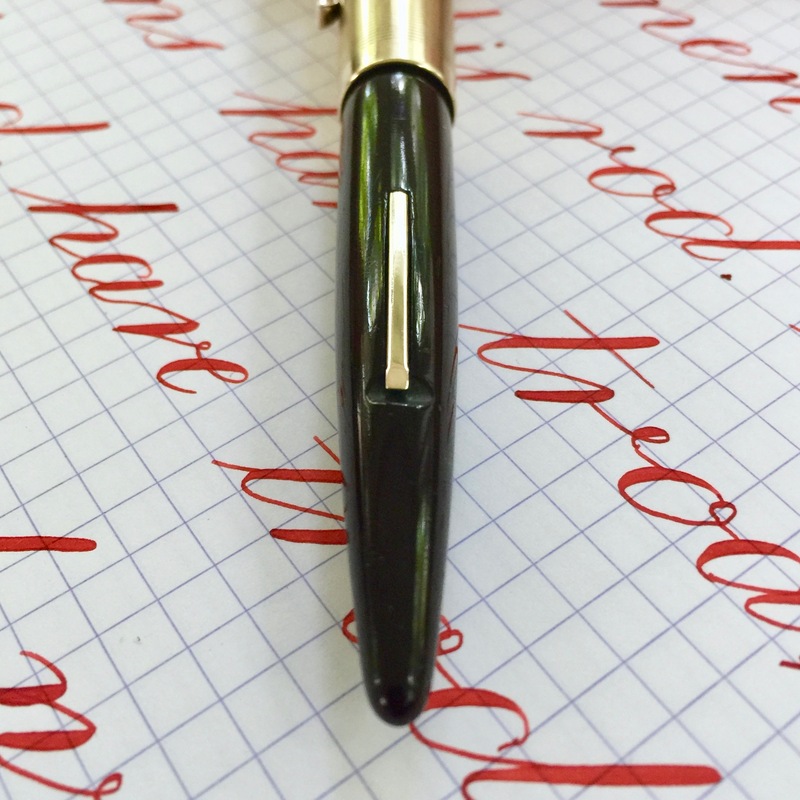 The pen has a lovely, bouncy responsiveness. 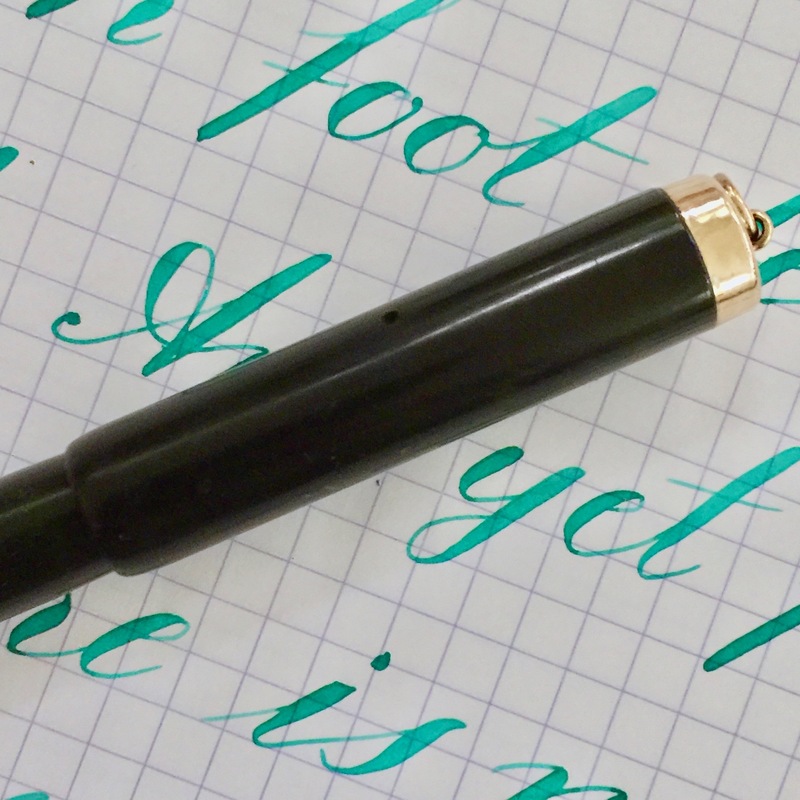 The flex working in tandem with the stub nib give it a very responsive feel. 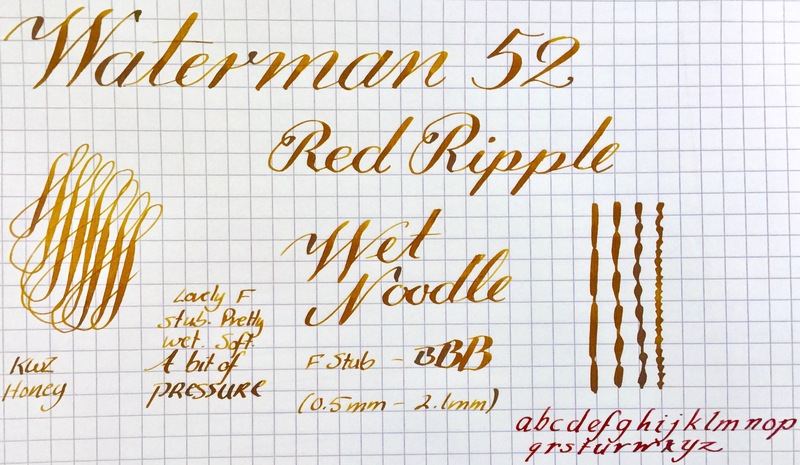 This is a one of those nibs that a lot of people are searching for: a beautifully writing paintbrush soft wet noodle stub. 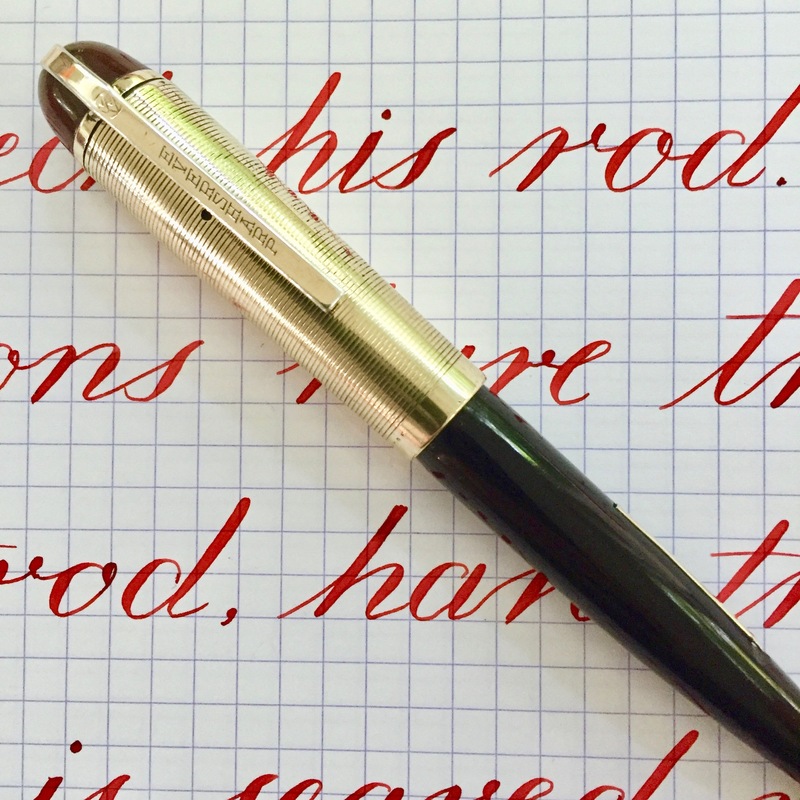 And on Waterman’s superb red ripple 52. This is a Skyline in Demi in size in brown plastic with a gold filled cap and trim. The pen is in good condition. There is very light scratching on the body, but after buffing and polishing it’s greatly reduced. The cap has a few very small and minor dings. Nothing you could really capture well in a photo. There is some very slight wear to the gold filled lever and wear, but they look pretty good. The 14kt. 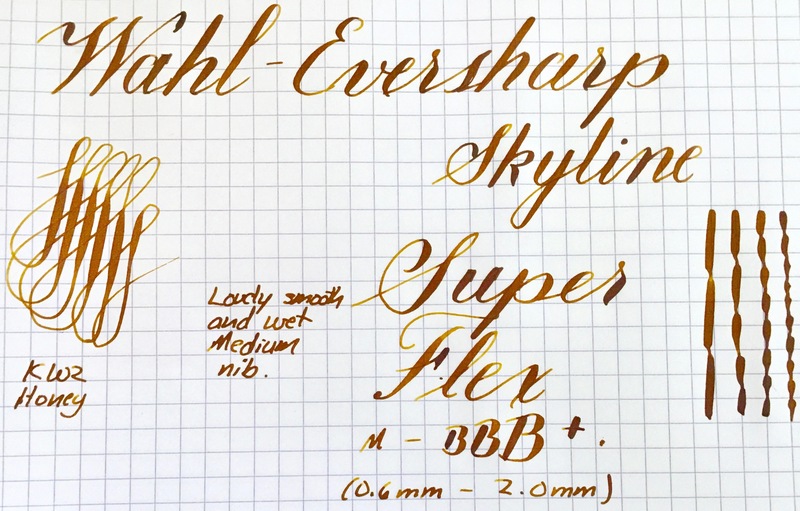 Eversharp nib is a great XF that writes smooth and glassy. It also has some good flex going up to 1.8mm. It has very good responsiveness allowing for some nice crisp flex writing. 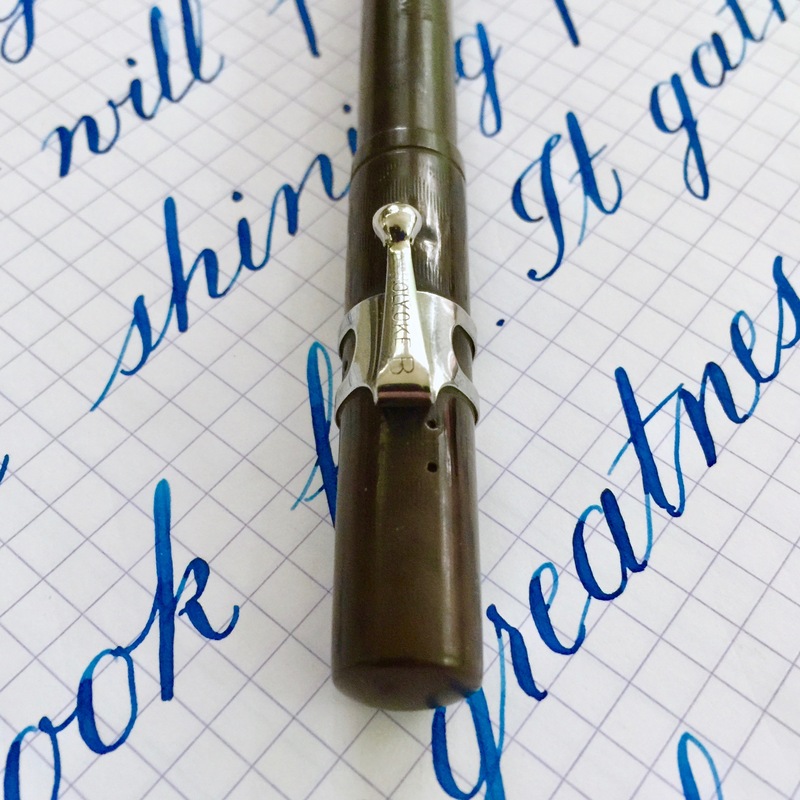 The feed is also excellent providing plenty of ink for flexing (you aren’t going to be railroading with it), but not so much that it makes normal writing sloppy. 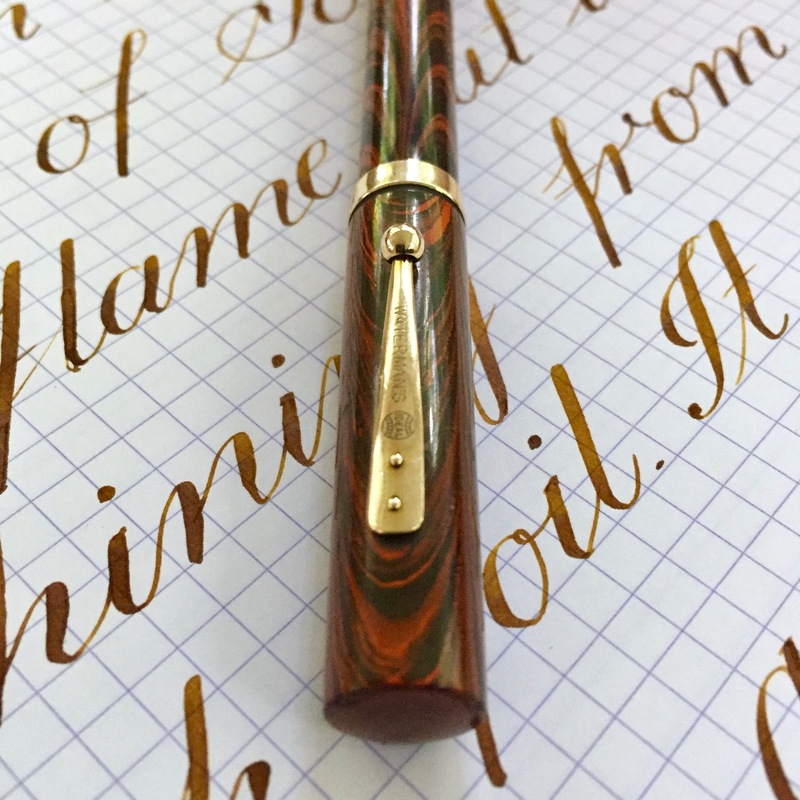 A superlative pen.